It is true that we recommend purchasing a diamond online instead of going to a physical retailer. You will get better bang for your buck purchasing from a reputable online retailer like Blue Nile or James Allen. That said, there are many better options than Malabar Gold & Diamonds. Their service and quality were below standard and their prices ranged from high to obscene. I can see no valid reason to purchase from them. Every other place we secret shopped in Singapore provided a superior experience (and we have no relationship with any of those retailers). Malabar Gold and Diamonds is a BIS certified Indian jewellery group headquartered in Kozhikode, Kerala, India. The Malabar Group of Companies was founded by M. P. Ahammed in the year 1993. He is also the company’s current chairman. Malabar Gold and Diamonds has more than 250 showrooms across 10 countries at present and it is one of the largest chain of jewellery stores in the world. The company also owns a network of luxury watch boutiques across India, which services under the name Malabar Watches. The Malabar group has been awarded with the ‘Brand of the Year’ award by Superbrands for five consecutive years (2013 – 2017). Malabar Gold and Diamonds has also received an award by the ‘Retail Jewellers India’ organization in 2017 for their special contributions to the gemstone and jewellery industry. In 2015, Malabar Gold company in Dubai, UAE created a Guinness World Record by producing the world’s longest handmade gold chain. The 22-carat gold chain, named as the ‘Dubai Celebration Chain’ measured up to 5 kilometres long, weighed 240 kilograms and had over 4 million links, which took 100 craftsmen over 45 days to produce. 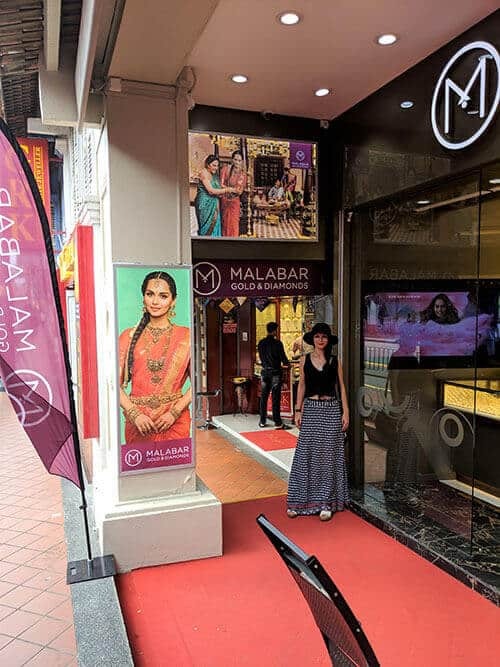 Malabar Gold & Diamonds was the largest jeweller in Little India (as well as the most popular based on our internet research), so we used them as an excuse to explore a new neighborhood in Singapore. While we were charmed by the neighborhood, our experience at Malabar was about as far from charming as you can get. We first tried their shop on Syed Alwi Rd. Despite listing their opening time at 10:30, we showed up at 11:00am and they were all standing around. We were rudely told that we need to wait for 10 minutes. It didn’t look like there was any chance they will be ready in 10 minutes, so we went to their larger location on Serangoon Rd. This store was open and ready for business. The store is bright and has an abundance of gold on display. We wandered around the store until we found a small display in the back corner for diamonds. We looked at the showcase for a solid ten minutes without anyone offering to help us. Finally we asked for some help. This was a first for me. It boggles my mind that you would let someone walk into your store who is looking at the most expensive items you sell and completely ignore them. The salesperson came over and we asked to look at a couple of rings they had there. The salesperson did not look happy to be there or to have to deal with us. Every question was brusquely answered. We may have been able to overlook Malabar’s failings at customer service had their diamonds been top notch. They were decidedly not. The first diamond we looked at was a 1.00ct G color VS1 clarity round diamond. The diamond was mounted in a three stone gold setting with 0.41ctw sidestones. The total price for the ring was 16,482 sgd. This was the worst cut diamond we saw while secret shopping in Singapore. Depth is the most important characteristic when looking at a diamond’s cut (you can read about this topic in our cut article). This diamond was incredibly deep (66%), causing the diamond to look much smaller than a typical 1ct diamond and made the diamond dark. It was lacking in brilliance and had a dead look to it. 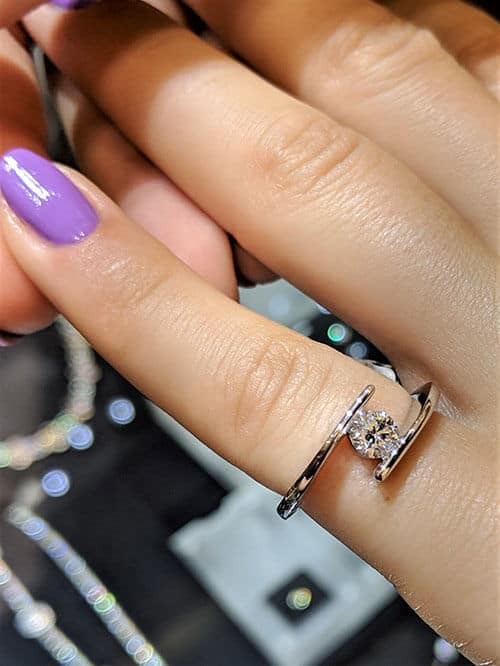 The second engagement ring we looked at was a white gold twisted solitaire setting. The ring had a 0.50ct D color, VS1 clarity round diamond mounted in it. Once again, the diamond was very poorly cut. The price for this ring was 3,219 sgd. So the service was underwhelming and the quality of the diamonds was subpar. How did they stack up in terms of value? Let’s start with the first ring we looked at: The 1.00ct G color, VS1 clarity round diamond in a three-stone ring for 16,482. Here is a 1.00ct G color, VS1 clarity round diamond from Blue Nile for 6,900 sgd. This diamond is just as poorly cut as the diamond from Malabar. I would never recommend this diamond. I am just showing you a diamond for an apples to apples comparison. You can add it to this three stone setting for a similar look to the ring from Malabar. The sidestones are smaller, but you get the idea. The total price is 8,120 sgd. The ring from Malabar is double the price of this ring. If you would prefer to see how you can get better bang for a 16k budget, take a look at this diamond. Here is a stunning 1.30ct G color, VS1 clarity round diamond from Blue Nile. This diamond is 30% larger and far superior in brilliance. You can have this diamond set in the same setting and still save more than 10%. The second diamond we looked at was a 0.50ct D color, VS1 clarity round diamond in a twisted solitaire gold setting. Here is a similar diamond for 1,866 sgd. If you add it to this solitaire setting, the total price comes out to 2,524 sgd. This ring doesn’t have as much of disparity as you did with the first ring, but it was still 30% more expensive. I recommend buying diamond jewelry online for several reasons. First, reputable online jewelry retailers like James Allen and Blue Nile offer excellent value for money. Second, you’re able to see exactly what you’re getting, with detailed information about each diamond and setting. 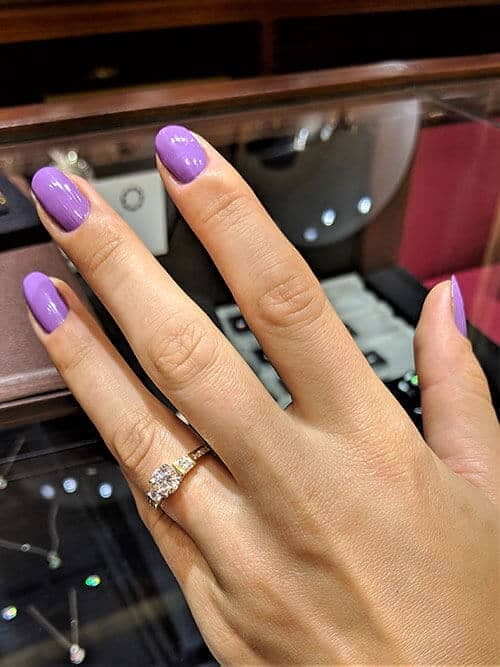 Third, while there’s no hands-on customer service, it’s usually easy to find the help you need to make an informed, smart diamond purchase. Fourth, there’s a huge selection of different diamonds and settings available to choose from. 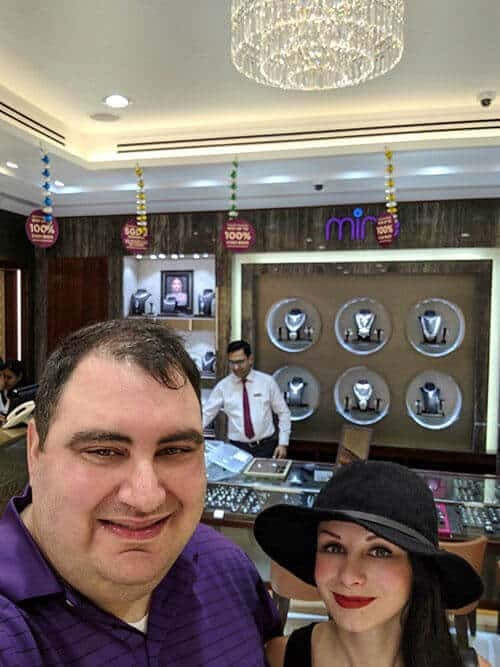 Our experience at Malabar Gold & Diamonds in Singapore really exemplifies the advantages of shopping online. We experienced bad service (including a shop that wasn’t ready for business a full 30 minutes after its opening time), a limited selection and extremely bad value for money. I can see no valid reason to buy diamond jewelry from Malabar Gold & Diamonds. The selection is limited, the service is poor and the diamonds were low in quality and around twice the price of similar options online. In short, Malabar Gold & Diamonds is not recommended. 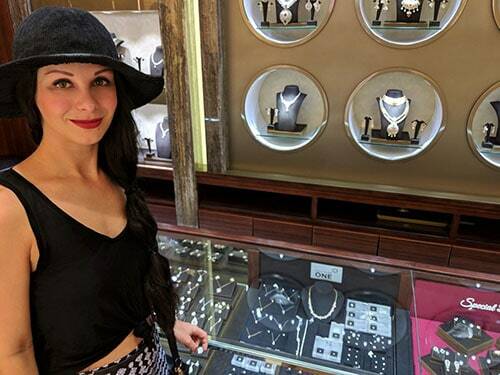 By buying from an online retailer such as James Allen or Blue Nile, you’ll save about 50% compared to what you’d pay at Malabar, all while enjoying a wider range of options and significantly higher quality diamonds.